Many great historical chiefs are celebrated in Native American popular culture. The most commonly remembered names include Crazy Horse, Geronimo, Red Cloud, Tecumseh and Chief Joseph. Along with these belongs the 18th century Muscogee Creek chief Alexander McGillivray, a great man who is not as commonly spoken about, but is just as significant to both Native American and United State history as those formerly mentioned. 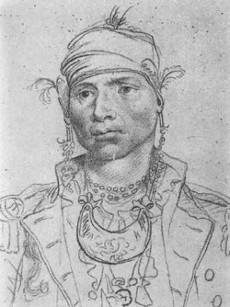 Alexander McGillivray was the principle chief of the Creek Nation near the end of the 18th century. He was the son of Sehoy Marchand, a French-Creek woman from the powerful Wind Clan. His father was the prominent Scottish trader Lachlan McGillivray who immigrated to Creek country in 1736 from Dunmaglass, Scotland, and spent the majority of his time in Little Tallassee and Otciabofa which was also called Hickory Ground  on the Coosa River. This is where Lachlan met Sehoy. Lachlan secured lands amongst the Creek people near the ruins of the French Fort Toulouse close by Little Tallassee. There, he planted a garden and built a plantation house, naming it the “Apple Grove.” In time Lachlan became a wealthy trader, entrenched and well respected among the Indians. When Alexander was a young man his father sent him to Charleston, S.C. to be educated in the British tradition. After returning to his home on the Coosa River, Alexander was honored as a chief on the Creek National Council and given the name Hopue-hethlee-Mekko or “Good-Child King.” Shortly thereafter he was commissioned a colonel in the British army and installed as the English Agent to the Indians. He donned the uniform of a British officer, with the headdress of a Creek chief, complete with the white feathers of his rank and led a faction of Creek warriors in the Battle of Pensacola. Before long, Alexander rose to prominence, becoming the principle chief of the Creek Nation. Being a fan of European history, he preferred to use the term emperor, though his actual power in the nation was severely limited and somewhat tenuous. He was a frequent visitor to and property-owner in Pensacola, FL, negotiating treaties with the Spanish who were the dominant European power in the region. He led Spanish funded attacks on American frontier settlements in Georgia. After the American Revolution, McGillivray was invited to Virginia where he received a paid Generalship from George Washington in the United States army. An eager capitalist, Alexander McGillivray was also an investor and silent partner in Panton, Leslie and Company who opened a trading post on McGillivray’s property, the first brick and mortar building established in Pensacola, FL. His first wife was Vicey Cornells who bore him two daughters: Peggy and Lizzie. His second wife was Elise Moniac, the sister of the Choctaw chief Red Shoes and they had three children: Margaret, Alleck and Elizabeth. As a native statesman, McGillivray worked tirelessly throughout his career to create a Creek Nation recognizable and respected by European nations, but still distinctly Creek, distinctly “Indian.” Much like his Cherokee neighbors he succeeded, at least until 1830, when the Indian Removal Act was signed into law by Andrew Jackson, robbing the people of their lands. In January 1793 McGillivray traveled to Pensacola for a business meeting with William Panton. On the trip he developed a fever and never recovered. On February 17, 1793 at eleven o’clock at night, in the home of William Panton, Alexander McGillivray died. He was buried in the garden of Panton’s house in Pensacola, laid to rest with full Masonic honors . Alexander McGillivray was such a loved and respected leader that he was mourned throughout the lands. His obituary ran in London in the Gentleman’s Magazine. Hickory Ground; a very special town and meeting place within upper Creek Country. Creek; Ocē vpofv, also called Little Tallassee. It is believed that Alexander McGillivray was the first Mason in the State of Alabama. Some researchers claim that A.M.’s remains were shipped to Scotland and buried on his father Lachlan’s land.